There still remains, after all this time, one key issue when it comes to the iPad’s Apple Pencil. While it is undoubtedly great for drawing and writing on an iPad or iPad Pro, there are equally undeniable issues when it comes to keeping the thing safe when it’s not being used, particularly when you are out and about. 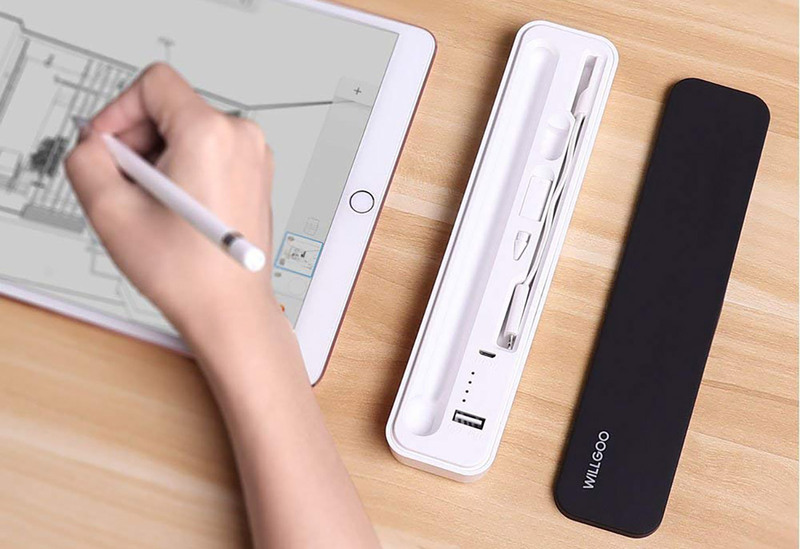 Some competing products have clips or slots in which a stylus or drawing device can be kept, but this is not the case with the iPad, leaving users to come up with their own solution. There are plenty of solutions on the market, with one of those being the PenDorra Willgoo Carrying Case. As that name might suggest, this is a carrying case for your Apple Pencil, but it does more than that. Even though the Apple Pencil can last a long time on one charge and can be juiced up in seconds, there may be times where you need to charge your Apple Pencil when you don’t have your iPad to hand. Admittedly, this may be a very rare occasion but it’s a nice option to have when needed. We’d suggest the Willgoo’s biggest use is as a case, though, and in that regard, it excels. 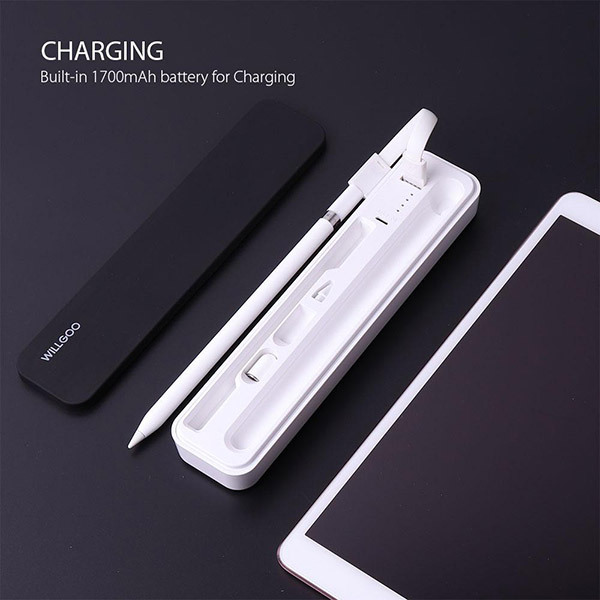 Made of a plastic construction with a magnetic lid, the case can house your Apple Pencil, a spare tip, the charging cable for the case itself, a Lightning adapter for charging the Apple Pencil with a standard USB to Lightning Cable, and room for an Apple Pencil cap, too. All of this can come in useful either when your Apple Pencil is in transit, or when it is charging. You don’t want to lose that cap, for example. With everything kept safe, if not in extraordinary style, we have to move on to the charging aspect of the case. We’re still not entirely convinced that this is needed, but the included 1700mAh battery should be plenty to give your Apple Pencil a few decent charges should it ever be required. If not, it can, in a push, have a go at charging an iPhone but it’s only going to be capable of topping it off rather than fully charging it. The case itself has four LEDs on it so that you can tell when it’s fully charged, and there’s an included micro-USB cable for doing exactly that. Speaking of cables, the only issue we had with the charging side of the case is the fact there is no USB-to-Lightning cable included for charging the Apple Pencil. We can see why, and it’s simply a case of cost, but there’s no room to store one in the Willgoo, either. We don’t mind using our own cable, but we’d have liked there to be somewhere to keep it. If you take the battery pack element out of the equation, we think this is a great way of storing your Apple Pencil whether it’s in a bag or on a desk. We all know the Apple Pencil has a life of its own when it comes to rolling off and under things, so having it safe and sound is a great idea. At $25.99, the Willgoo isn’t the cheapest offering around if you don’t use the battery pack, but we do like the magnetic lid, so that’s a positive here. 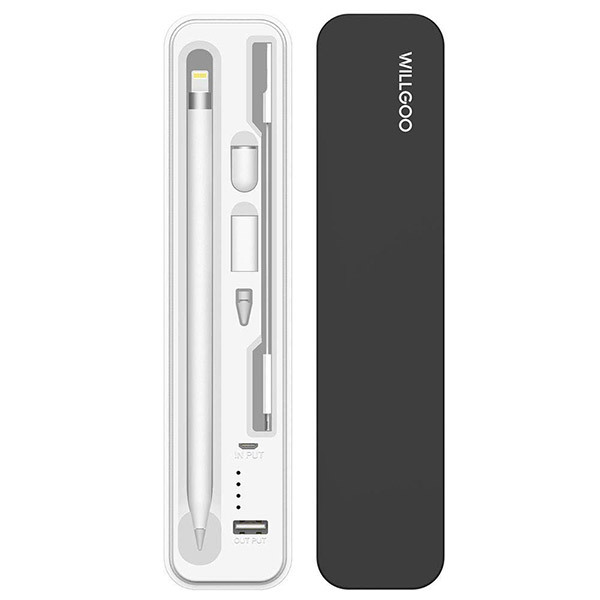 The way we see it is this – if you need a place to keep your Apple Pencil, there are much worse places to put it than inside this Willgoo case. Add in the fact it can charge your Apple Pencil, or to some extent, any other USB device as a bonus, and we reckon this is well worth at least checking out, so long as you have your own Lightning cable and somewhere to stow it, of course. The PenDorra Willgoo Carrying Case can be bought from Amazon right now for $25.99.